Now that Halloween is behind us, its time to start focusing all of our attention on the favorite table of the year: THANKSGIVING!! A time to be thankful for those crazy family members seated across from you and fill your plate to the brim with sweet potato casserole, turkey, stuffing and pumpkin pie! 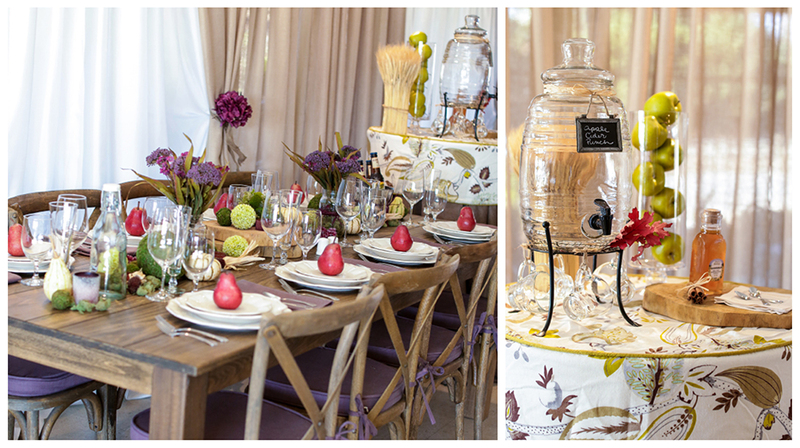 Its also the time to dress up your table and go-all-out: fancy linens, fun place cards and creative centerpieces! I love fall colors: deep oranges, burgundy, brown…all the warm colors that remind us of this blessed season. However, adding in unexpected bright colors and textures are my favorite! 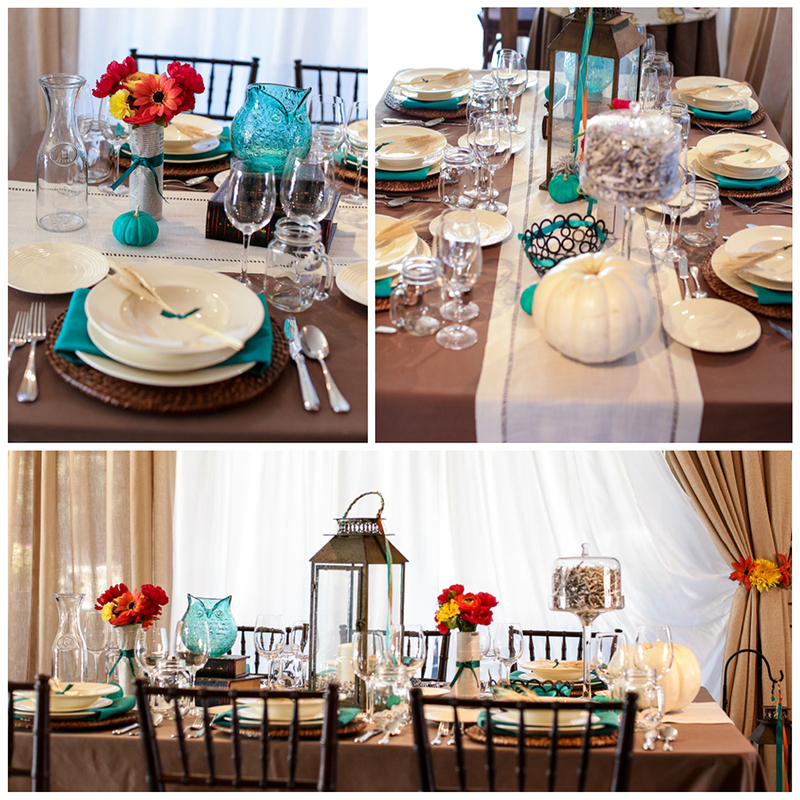 Like this fun Pinterest-inspired table with pops of teal! Our Petaluma store manager, Sara, discovered this link on Pinterest and fell in love! She thought it would be fun to recreate it using all of Encore’s fabulous items along with some fun creative additions… hello teal-painted pumpkins!!! 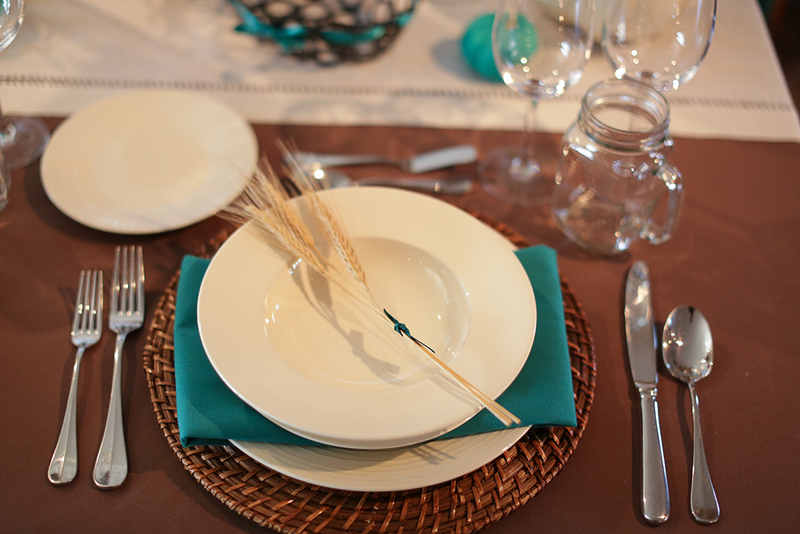 Our nutmeg linen and natural runner provided the perfect canvas for the eclectic details like the shredded newspaper-filled cake stand and the teal glass owl. 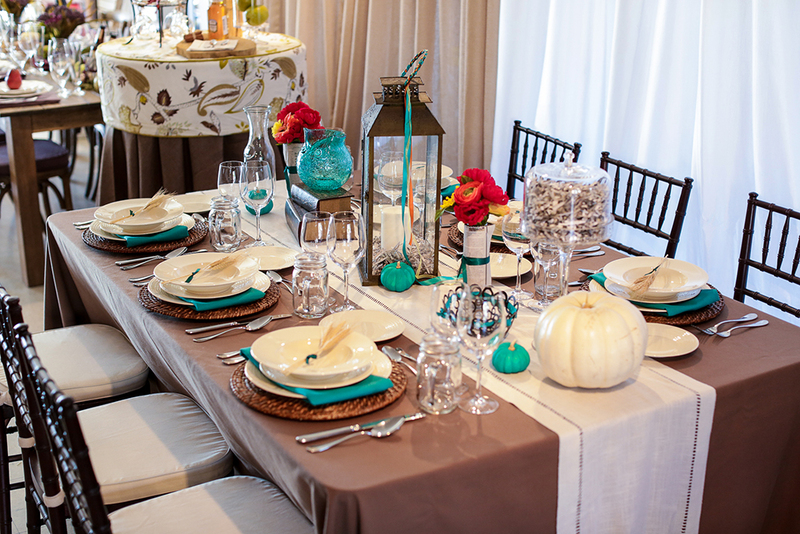 Even if you cover your table with more neutral colors, popping it with a bright napkin, like our standard teal, is a great idea! 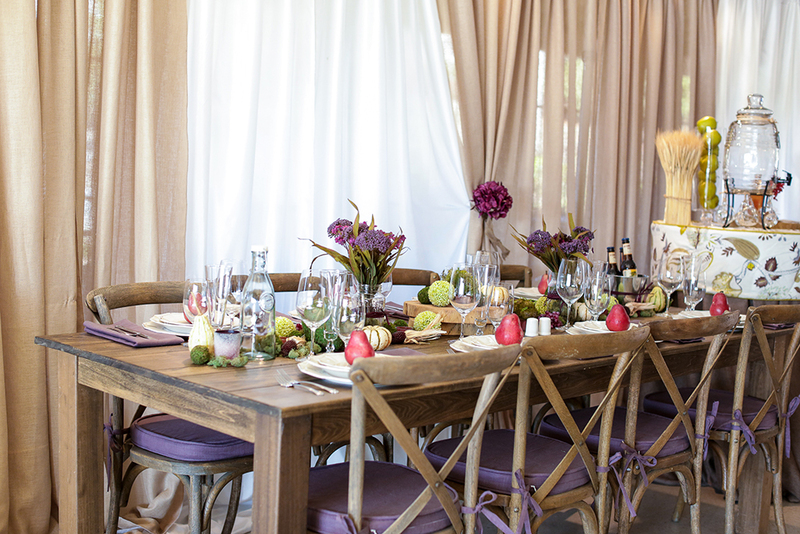 Our farm tables and bistro chairs are popular this time of year for a more rustic table setting. Adding bright and pretty details will keep this beloved theme colorful and elegant. If you are short on space this year, consider renting a high cocktail table as a beverage station. Topped with a pretty linen, this table is the perfect height for beverage dispensers and can be easily tucked away in a corner of your dining room. 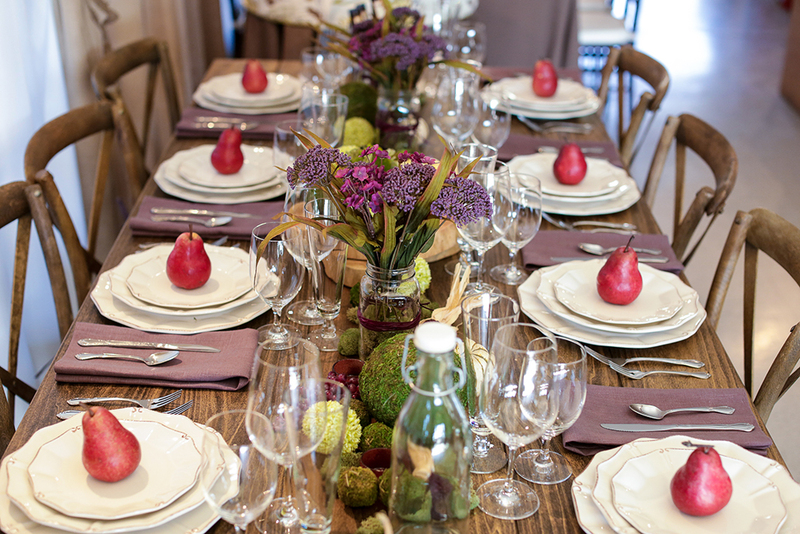 Bright pears on our villa china with plum napkins and chair pads add the perfect touches of color. 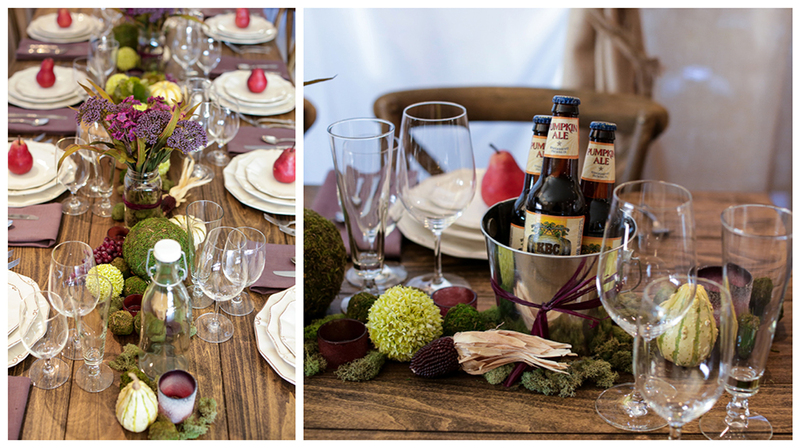 Moss and wood disks add texture to the centerpiece and bring the outdoors inside! Pilsner glasses and buckets of beer ensure your table isn’t just for wine-lovers. Our showrooms are full of ideas, ready to inspire you or make it easier on you!! Both of these are currently in our Petaluma showroom if you want to swing by in person. 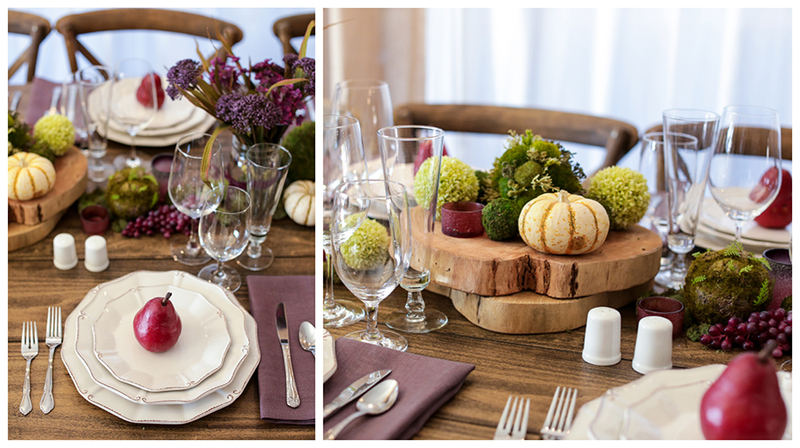 Stay tuned next week for even more Thanksgiving ideas!